Josephine Suppa (nee Rossi) 92, of Port Richmond, passed away on July 12, 2017 at Eger Nursing Home. Born in Jersey City, NJ, Josephine moved to Port Richmond in Staten Island, NY in 1959 and has lived in the same house for over 60 years. She was a homemaker and enjoyed baking, gardening and shopping around her neighborhood stores. 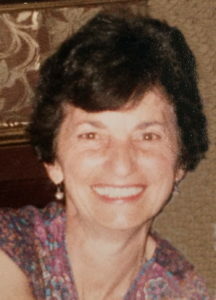 Her greatest enjoyment was her love of family, especially her grandchildren. Josephine is predeceased by her late husband Orlando. She is survived by her loving sons, Raymond (Louann), Kenneth (Fran) and Mark (Cathy) Suppa, Beloved Sister of Louise Smaltino and Robert Rossi. Josephine is also survived by 11 Grandchildren, 3 Great Grandchildren and a host of nieces and nephews. Funeral Service from Cherubini McInerney Funeral Home, 1289 Forest Avenue, Staten Island, NY on Saturday, 8:30am, Mass of a Christian Burial at St. Roch’s RC. Church at 9:00am followed by an interment at Hollywood Memorial Park Cemetery. Friends may call on Friday from 6:00pm-9:00pm. My deepest sympathy to The Suppa Family on the passing of a beautiful lady. My deepest sympathy to the Suppa Family. Thoughts and prayers to all may she rest in sweet peace. My Aunt Jo was a wonderful woman. She was an incredible wife and mother and aunt and will be greatly missed. She has always been in my thoughts and prayers. My deepest sympathy to the Suppa family. She was a wonderful woman and neighbor. She will be missed by all.